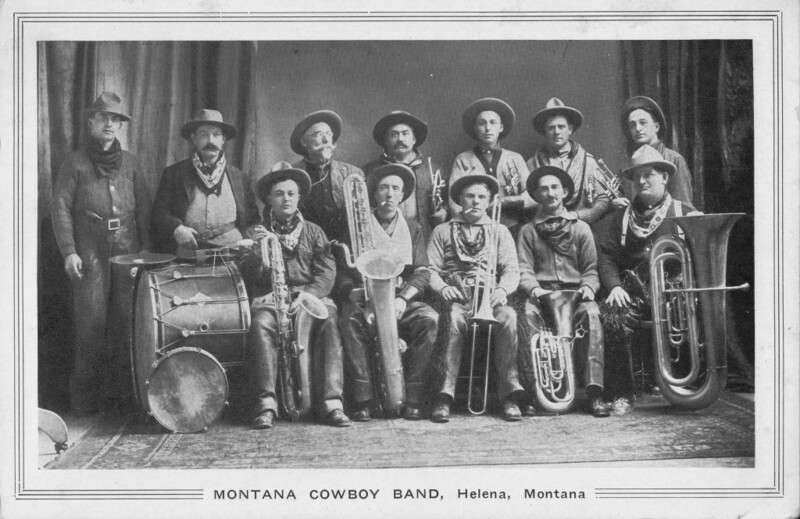 (Northfield, MN)– In 1912, a cowboy band and a group of Blackfeet Indians from newly developed Glacier National Park traveled to expositions in Minneapolis and Chicago to promote the state of Montana. Hired by Great Northern Railway President Louis W. Hill, the son of James J. Hill, the musical ensemble included a cornet soloist named G. Oliver Riggs. Award-winning freelance journalist Joy Riggs, the great-granddaughter of G. Oliver Riggs, will tell the story of this unusual adventure in an engaging presentation on Monday, November 14. Joy will speak at 3:30 p.m. at the Northfield Retirement Center Chapel, 900 Cannon Valley Drive West, and again at 7 p.m. at the Northfield Senior Center, 1651 Jefferson Parkway. This Vintage Band Festival educational event is free and open to the public. Joy is writing a book of memoir and history about the extraordinary exploits of her paternal great-grandfather, a pioneering Minnesota band director. She received a 2015 emerging artist grant from the Southeastern Minnesota Arts Council (SEMAC), and she serves on the board of the Vintage Band Festival. She blogs about her book project and her family’s adventures in making and appreciating music at mymusicalfamily.blogspot.com. Joy grew up in Alexandria, Minn., and has lived in Northfield for the past 18 years with her husband and their three children. This entry was posted in Historical Narratives, VBF News on November 7, 2016 by Dan Bergeson.